Kotak Urja has developed its Sparkler solar lantern with a dual charging system (solar and AC charging options). This LED lantern is light-weight and rugged, with long hours of backup. The lantern is built for safety with a steel grill covering the acrylic and rubberised base to absorb sudden shocks, in case of a fall or the lantern being dropped. Even the electronic circuitry and battery are protected. BPL Techno Vision Pvt Ltd launched an innovative rechargeable LED based solar lantern lighting—BPL SL1300. This solar lantern is affordable and is equipped with a solar charger and uses BPL’s Q Tech technology, which allows charging even in fluctuating power and has an AC mains charging range from 90 V to 260 V. It also has a dual charging mode—AC charging using Q Tech technology as well as charging through a solar panel. While AC charging takes four hours for five hours of lighting, charging through the solar panel can provide 3.5 hours of light. This model is priced at Rs 1299. Multi-purpose lanterns with added features: Going by the trends, manufacturers now offer multi-purpose lanterns catering to the specific needs of spread light, focused light, hanging lights or torch lights. Sometimes, all these requirements can be served by one single lantern. Gautam Polymer Group has launched the Solid Solar brand of lanterns, which are multi-purpose, have zero tension light and run for 12-14 hours with a single bright light, whereas with a double bright light they run for 6-7 hours at 3 Wp. With an efficiency of over 80 per cent and luminous performance of 80-100 lumen per watt, this multi-purpose lantern also has an additional mobile charger connection. “Every year, we upgrade our products—earlier we had a switch button on the lanterns; now, we use microcontroller based buttons,” says Shubhra Mohanka, director, Gautam Polymer Group. In April 2012, the company launched the Shivling CFL lantern. Many of the solar lanterns feature mobile charging sockets (USB type), battery level indicators (as in mobiles) and FM radio options. Kotak Urja has recently filed a patent for one of its products, which apart from carrying all the features just mentioned, also has a projector and fake currency detector. Solar hawker lights: These solar lanterns are designed for hawkers residing in rural as well as urban areas. They come with a 5 W CFL light, and offer illumination for longer hours than a kerosene lamp. These also come with the mobile charging facility and offer lighting for up to 8 to 10 hours after full charge. These solar lanterns cost between Rs 2500 to Rs 3500, and come with a battery and charge controller housed in a cabinet at the base of the lantern. Solar lanterns with different light source: CFL and LED bulbs are replacing conventional incandescent bulbs in solar lanterns. Efficiency here is measured in terms of the power consumed—CFL and LED bulbs with lower power ratings produce more light. These bulbs have a longer life than ordinary bulbs. While a standard CFL has a life of about 6000 hours and can spread the light upwards as well, the more advanced LED lights run for almost 50,000 hours. Rashmi Industries offers a solar lantern with a 7 W CFL, which provides a light output of 52 lumens per watt, equivalent to that of a 40 W (9 lumens per watt ) bulb. This solar lantern has a built-in detachable electronic circuit with an inverter and charge controller. A highly efficient two-step charge controller protects the battery from deep discharge and overcharging. Another domestic manufacturer, Saur Oorja, offers solar lanterns with fluorescent tubes, LEDs and CFLs, with a battery power ranging from 1.3 Ah to 7 Ah. “These have an automatic lighting up device in case of power failure, and a built-in electrical charger with overcharge protection for safety and long life. These lanterns are available with both amorphous and monocrystalline panels,” informs DK Varshnei, director, Saur Oorja. 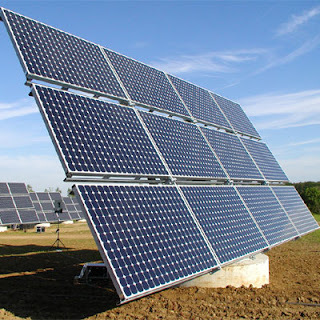 Choices in solar panels: Different types of solar PV panels can be used to power solar lanterns—crystalline and amorphous (thin film). Crystalline panels take up less area than the amorphous panel for the same amount of energy produced. However, crystalline panels do not perform satisfactorily under cloudy or not-so-bright conditions, when compared to amorphous panels. The choice of the panel depends on the location of the lantern as well. Typical ratings of the solar PV panel range between 8 Wp to 10 Wp. Different types of batteries: The size or capacity of a solar lantern’s battery is determined by Ah—the greater the Ah of the battery, the longer the bulb can be used. These lanterns usually have a 6 V/4.5 Ah SMF lead acid battery. Nickel metal hydride, nickel cadmium and valve-regulated lead acid (VRLA) batteries are the three commercially available alternatives being used in lanterns. BPL Techno Vision has launched a rechargeable LED lantern called Chirag. It uses a 3.3 V and 1600 mAh battery. Unlike the 8-12 hours of charging required by some batteries, this lantern requires only 4 hours of charging and runs for more than 5 hours. The backup offered by some of its lanterns is as long as 14 hours. The Jumbo LED and Wonderlite CFL solar lanterns by Kotak Urja not only offer long battery backup but also ensure the lantern is safe. These lanterns are available in both bright mode and night mode (dim light). Although a solar lantern is a simple device, buyers have a number of doubts while procuring a solar lantern, particularly due to its high price, compared to kerosene lamps. Also, with an array of products available in the market, a buyer might end up buying a low quality product or one that might not be worth the money spent. Thus, a few things should be kept in mind while procuring solar lanterns. Prolightsystems Solar power is gradually finding its reliability in the existing times where the non-renewable sources of energy such as oil, non-renewable petrol, etc are decaying at a constant rate. exactly now we all need to be serious about using Solar Power.